Send a piece of good health to with a prized Tea Pillow. 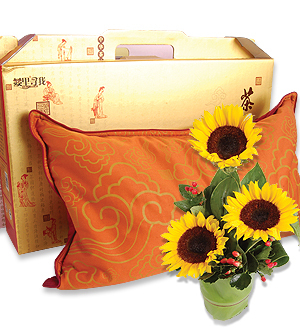 Gift comes with a pot of Sunflowers. - Filled with Lavender and Green Tea, this is believed to be effective in easing headache. Contains JueMingZi that may improve vision and digestion. High grade TieGuanYin tea creates a pleasing aroma which makes you feel refreshing. A great accompaniment in promoting good sleep. Filled with high-mountain Green Tea and herbs to smoothen Qi and calm nerves. Fresh flowers applicable for delivery within Klang Valley, Johor and Penang. For other States delivery, fresh flowers will be replaced with a silk or preserved posy.